1 Facing the Black Lion Inn turn R to walk uphill. Just after the pylon turn sharp L to follow a signed path up into the woodland. Go through a G and continue upwards until you turn R onto a track by a farm, then L at a finger post to follow a grassy path up the bank. When you reach the tarmac track, turn L.
2. Just before road swings L to a G, turn R to walk across the field and over a S. Walk ahead to go through sheep hurdles in the bottom corner of the field next to a conifer wood. Walk diagonally L down the field and along a sunken track. On reaching a slate tip on your R, turn L over the ridge before dropping down to go through another G. Ignoring the track, bear L to go down a steep bank to reach a grassy track. R before exiting the woodland through a G.
4. Turn L keeping the wall on your R to follow a path past trees. At a junction where a wall comes down from L, turn L to walk diagonally up the field to reach a track. Turn L and walk up through a G before turning immediately R along a grassy track. Join another track and follow it L around the rocky hill. As it peters out, turn R to cross the field, keeping the stone barn on your L. On reaching the fence, turn R and follow it to a G on your L.
5 Go through the G and walk directly ahead to go through the R hand G. Continue ahead bearing slightly L through a G on your R. Bear L downhill and through a G next to a track. Follow the LH fence down through a G at the bottom of the field and on ahead towards farm. Keep farm buildings on L to go through yard and exit via tarmac lane on R. At the brow of the hill, turn immediately R by a finger post to go through a G.
6. 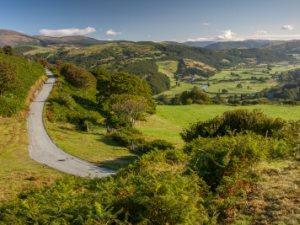 Walk ahead bearing slightly L before dropping down through a G. Continue downhill aiming for bends in the River Dyfi to gradually close with a stream on the R in trees in the far bottom RH hand corner, cross stream and on through a G into a field. Turn L to walk along the woodland boundary to climb a S, then turn L then R to follow the path down to the main road.